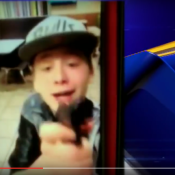 Punk Kid Waving Gun Around At McDonald’s To Look Cool On Social Media, Gets Arrested … Imagine That! Obviously this kid is an idiot and has some serious personal issues he needs to deal with. However, it is this kind of thing that makes law abiding gun owners look dangerous. WKBN – An 18- year-old from Niles is facing serious charges after he began waiving a gun inside a downtown McDonald’s in Ohio. WKBN has obtained the video, posted on Facebook, which led police straight to him. Justin Riley posted that video while he was eating at the McDonald’s in Niles. When police arrived, he was still inside. “I had to stop at McDonald’s and charge a n**** phone. Grab some grub, bro,” Riley said in the video. Moments after Riley posted the video, police got a call from a concerned individual. Fearing for the safety of the patrons and staff of the McDonald’s, police rushed to the store. Riley was still there.The video police obtained from Riley’s Facebook page shows him inside near the rear of the restaurant around 9 p.m. Tuesday. It’s not clear who he is talking to, but Riley can be seen repeatedly using racial slurs. At the end of the speech, Riley grabs a gun and points it at the camera. Criswell said that police found a black Cobra Utah 380 pistol on Riley. The gun still had four live rounds inside. Riley had just turned 18 on April 1. In some respects this makes gun owners look worse than when a gun is used in a crime. Why? Because people understand guns are used in crimes and usually attribute the actions to criminal behavior. This on the other hand is exactly what anti-gunners highlight when trying to describe gun owners carrying in public. They like to portray us as people using a firearm to intimidate, and looking for a reason to escalate a situation.